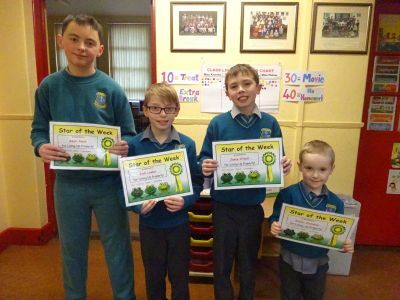 Congratulations to all our ‘Stars of the Week’. They have all worked immensely hard to achieve this title. Keep up the fantastic work! Well done to this week’s stars of the week who put in a tremendous effort as part of ‘Seachtain na Gaeilge.’ The standard was so high this week that 6 boys and girls were selected! 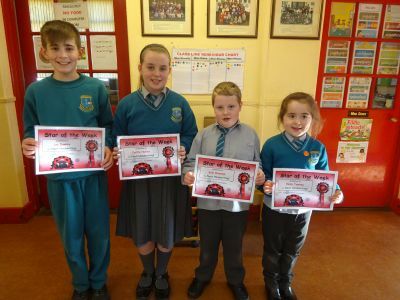 Well Done to Josh, Leona, Sophie, Rían, Anna agus Aisling. 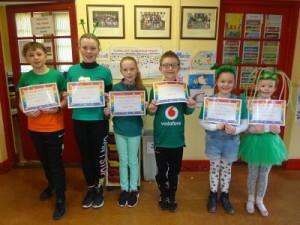 Maith sibh. 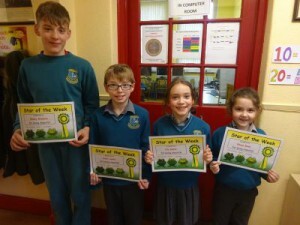 Well Done to Dylan, John, MacKenzie and Cadence who are this week’s stars of the week. They worked really hard at their Maths. Keep up the great work! Well Done to this weeks star’s of the week who were chosen for being cheerful! 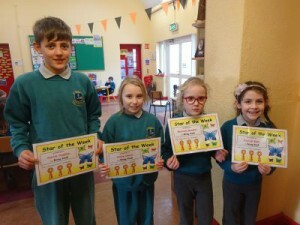 Pictured are Bobby, Josh, Lily and Rhona. Keep smiling! Well Done to this week’s Stars of the Week! 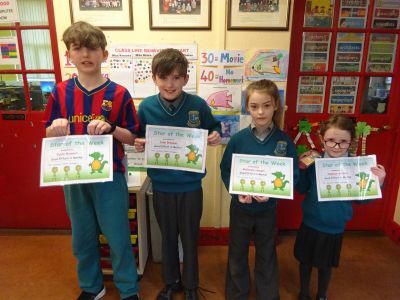 Pictured are Patrick, Ailbhe, Muireann and Rhona who were all chosen for being kind. This week’s stars of the week were Leo, Caitlín, Kyle and Emily who all have very neat handwriting. Well Done! 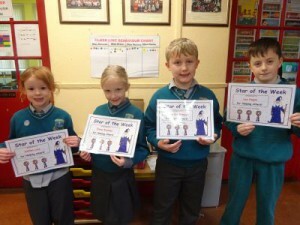 This week’s stars of the week were Ashlinn, Emma, Aaron and Leo who were very helpful throughout the week. Well Done!